I love to travel. My favorite way to travel is by aircraft, for me the feeling of flying is beyond words and I never tire of gazing through my window seat porthole at the cities, mountains, rivers and clouds below as I jet above the earth. If I had a chance to fly in rocket ship or a fighter jet plane, I would take it. Now I’m not keen on jumping out of planes or hang gliding, I really don’t fancy myself a bird. I’m just a humble human riding on the wings of technology and I love it! The Open Doors Organization, a company I work for, 2015 Marketing Study on Travelers with Disabilities tells us that in the US, over a two-year period, 26 million travelers with disabilities have taken 73 million trips spending 34.6 billion dollars for general travel. Of those numbers air travel has contributed $9 million in spending with 11 million travelers taking 23 million flights. People with disabilities want and do travel, but for us, taking a flight isn’t just about booking a seat, finding that seat and settling in for the flight, without a worry. We, must plan, plan, plan and communicate, over and over to airline staff what our needs are and how to satisfy those requests. I know when I fly, I have a consistent low hum of anxiety about getting what I need and want, so I, too can settle in with confidence. 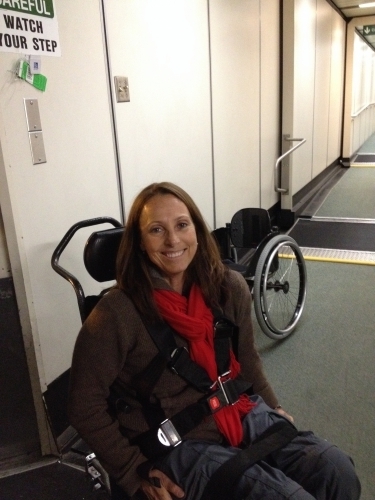 Air travel is not easy, especially if you travel with an assistive mobility device, i.e. wheelchair, but it can be made simpler by taking some precautions and using good communicating skills. I have a few tips that have created way less hassle and uneasiness for me when I fly, maybe they can aid you too. When ever possible, pre-board the aircraft. This will give someone that uses a wheelchair more options for wheelchair stowage and time to use theboarding chair, privately. There is nothing pretty or dignified about the boarding chair. Communicate your needs, be it needing extra time to pre-board the aircraft, or making sure your wheelchair is tagged properly. These details take time, so plan to arrive early. My pre-board experience sets the tone for the rest of my travel. If I feel I’m heard during this first interaction with airlines frontline gate staff, this gives me confidence that my needs willbe met throughout my journey. Pre-boarding will give you the option to store your wheelchair on-board, if the aircraft has a closet. In place of closet, some airlines will strap one wheelchair to a seat in the plane. This stowage is for one wheelchair, only, so first come first served. Otherwise your wheelchair will be stored in the belly of the aircraft. If your wheelchair is stored below, make sure you take all removable parts on-board with you, cushions, side guards, joy sticks or anything at all that will come off the chair. Leaving these items on your chair is risking that they will not return when your wheelchair is delivered to you at your destination. Don’t take chances with your gear. When pre-boarding, be articulate and let the staff know what you need. The law states that they must follow your directions, so tell them what you need and don’t need. You can even write the information down, attach it to the seat of your wheelchair, so this wheelchair handling information is clear and available to the airline staff at your destination. This will cut down on you having to tell people over and over what and how to do something, which can become very frustrating. This is all about creating confidence when flying the friendly skies. As travelers with disabilities we have some responsibility to make sure that airline staff knows what we need, they can’t read our minds, we must tell them. The training that they get right now, is limited, so we must do our part.And keep in mind my needs are different from yours, so have some patience with the staff. This way we, all travelers and airline staff, will have confidence in creating the best possible experience. My next blog I will share boarding, seating and deplaning the aircraft like a pro. Please send any ideas you may have! Sweet Dreams, and Blessings to All!! !